Mastering: Premastered by Dominik Müller, Mastered & cut by Simon at The Exchange. Artwork: Suka Off. ©2016 All Rights Reserved. 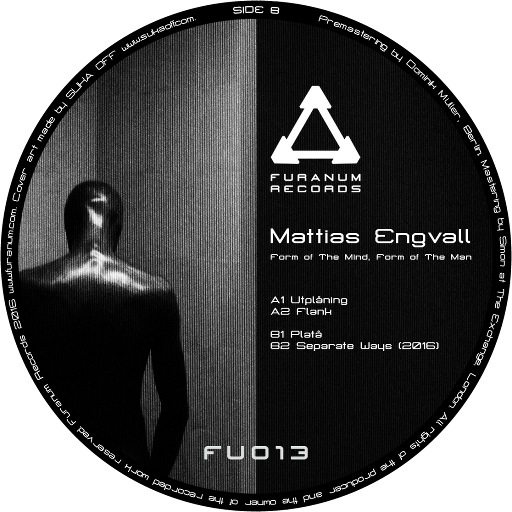 Following 2012’s At Least, Be Humane, label regular Mattias Engvall returns for his third EP and simultaneously first vinyl treatment on Furanum. Form of the Mind, Form of the Man serves as a compelling testament to both his evolution and roots, propelling his vision of techno into previously uncharted territory, both for himself as well as the label. Embracing a more minimalistic yet calculated approach, he subtly departs from the predominantly industrial underpinnings of his former works and into a more refined classical techno concept, while keeping the spirit and energy of his artistic vision consistent. As a fitting opening, “Utplaning” permits an ambient drone to breathe awhile before a stark off-beat kick pierces the sonic fog. Still sparsely populated at this point, the track gradually builds up with incremental elements towards a symphonic plateau that is persuasively maintained in force until the end. Subsequently, “Flank” establishes a forceful yet balanced groove from the outset, driven by a singular mid-range motif. The true magical allure of the composition, however, lies in the melodic story it begins to weave midway through, as a gripping refrain capturing equally the melancholic and the profound accompanies the listener until closure. Next, omitting the melodic core element of the preceding two arrangements and opting for a purely linear and pattern driven track, “Plata” compellingly places all its emphasis on a single sustained sequence interweaved with escalating rhythmic synth riffs. Closing the record is a reissue of Fu008’s “Separate Ways,” appearing now for the first time on wax. Fully modernized with remastered and reengineered dynamics as well as a honed and optimized arrangement, it transports one once more to the dark side of the nordic moon, exemplifying both the sense of pounding industry and dystopian trepidation that characterized Envgall’s previous output.